I’ve purchased a car, I’ve purchased a house, and yet the research I feel like I’ve done for purchasing baby products has seemed to be one of the more daunting grown-up tasks. When it came to looking for a car seat and stroller I was super intimidated and overwhelmed with all of the information out there! After tons of research and “test-driving” some of the models in person, we ended up selecting a Chicco Bravo Travel System. A big priority for me, being super-petite, was a system I could easily fold-up, carry, and feel comfortable pushing around. I also really liked the idea of buying something that was one full-system so that everyone worked together seamlessly and grew with the baby over time. Given how many questions I had about the process — from safety features, to different types of car-seats, to what extra features mattered, I reached out to the team at Chicco to see if they could give me some insight and help decipher all of the complexities of purchasing a stroller and car seat. I learned a ton (like did you know you can ask some baby stores to help you test out different car seats to find ones that work best for your car?!). Below are a few questions that I had about the process, with the hopes that they may be helpful for other first-time moms wondering some of the same things! Q: Let’s start with strollers. 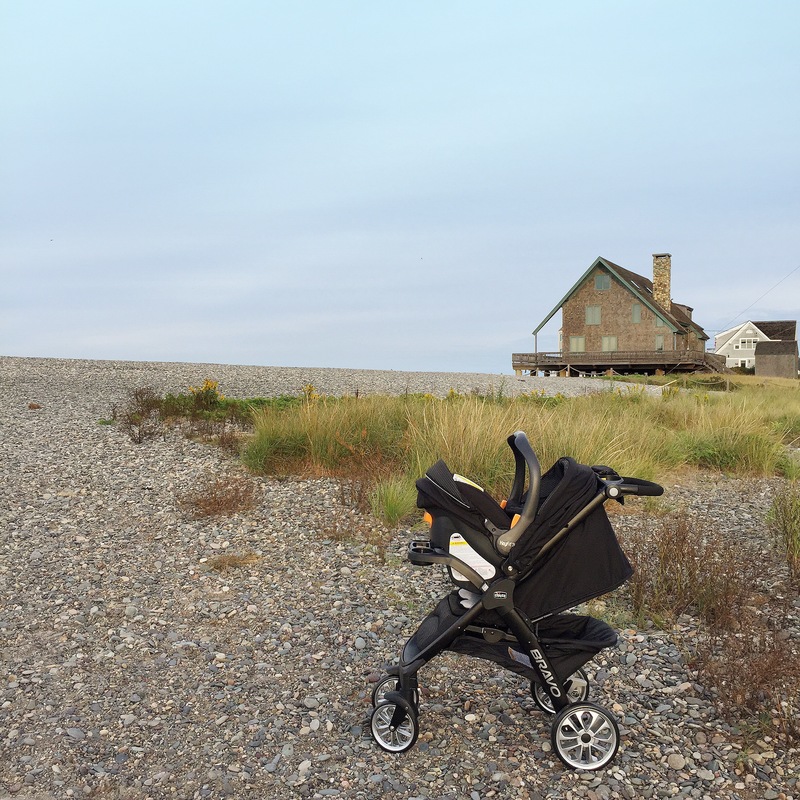 There are so many types of strollers with varying options – what features should we look for? A: You’re absolutely right that there are so many types of strollers, each complete with their own set of features. First and foremost, head to a local retailer and try a few out for yourself to get a sense for what is most comfortable for you as a parent. There are many features to consider, from the size and weight, to the storage and ease-of-use. Our latest strollers all have one thing in common, which is the ability to grow with your baby, eliminating the need to purchase several different strollers. A great example of that is the Bravo Trio System, which is an infant carrier, travel system and toddler stroller all in one, accommodating your baby from birth up to 36 months or more (up to 50 pounds). Q: I’ve noticed features like adjustable handles, reclining seat positions — should we be thinking about the ergonomics and size of the stroller — for both the baby and parents? A: We suggest that parents take a look at all of the features a stroller has and evaluate based on their priorities and lifestyle. Features like adjustable handles and reclining seat positions are designed to keep both parents and children comfortable while pushing or riding in the stroller. For example, if one parent is tall and the other is short, having an easily adjustable stroller handle would be convenient. Chicco’s Bravo Stroller handle can be adjusted just by pushing a button. Q: That was one of the features that lead us to choose the Bravo System actually, since my husband and I are totally different heights! Okay, let’s get to the good stuff, which accessories and features we should look for when reviewing strollers? A: Before you purchase a stroller, think about the accessories and features that would make bringing your baby along with you on-the-go easier. Features like large storage baskets, a lightweight frame and an easy fold can go a long way when it comes to convenience. Chicco strollers don’t require you to purchase an adapter to accept the infant car seat, and most also come with child and parent trays so you can easily carry your everyday essentials. Q: Really helpful! I paid a lot of attention to cup holders and storage baskets, and even a place to hold my cellphone when we tested strollers in the store. On to car seats, which I found even more intimidating to research since there are so many safety elements to consider. Let’s start with the types of car seats: infant, convertible, all-in-one, boosters: can you give us a quick overview of why there are so many types and what we should look for? A: There are many different car seats to accommodate your child at different ages and stages of their early years of life. First and foremost, no matter what car seat you’re using, we (and the American Academy of Pediatrics) recommend that your child ride in the rear-facing position until they are at least two years old, as it is safest for your child in the event of an accident. A newborn leaves the hospital in an infant car seat, and they typically stay in that until they outgrow it based on the manufacturer’s guidelines, as infant car seats are the easiest to transport in and out of the car and snap into strollers. A: The next stage is the convertible car seat, which has both rear- and forward-facing modes, many of which can accommodate newborns in the rear-facing position. However, because convertible car seats are designed to stay installed in the vehicle, many parents opt to stick with their infant car seat until the baby outgrows it or when the parents find the child too heavy to carry in it. Once your child outgrows the manufacturer’s guidelines in rear-facing mode, simply reinstall the car seat so that it is forward-facing. After a child outgrows their convertible car seat or forward-facing car seat with a 5-point harness, which some children use between the ages of 4 and 6, it’s time for a booster seat. We recommend that children are at least 5 years old before transitioning to a booster. High back boosters are used to maintain the vehicle belt and child in position. They are especially important for younger, smaller children who are less likely to stay in position correctly. Before transitioning to a backless booster, make sure your vehicle’s seat belt fits correctly on your child and he/she can sit in place and maintain the proper positioning throughout the ride. Also, if your child still falls asleep in their booster, we recommend that the back is left on because it enables them to stay in the proper position in the event of an accident. For easy reference, Chicco has an infographic with guidelines on the ages and stages of different car seat types, which can be viewed here. You can also visit Chicco’s car seat safety website, where you’ll find lots more information and resources. Q: Every car seat I walked past at the baby store had stickers and tags on them talking about all of the safety ratings, what should we be looking when it comes to safety features in a car seat? A: When choosing a car seat the most important consideration is finding a seat that fits your vehicle, fits your child and that you can install correctly every time. One way you can evaluate this is by testing car seats before you purchase. Most retailers will allow you to try several models in your car before you buy. Q: I didn’t know that! Do different seats work better in certain car models? A: As mentioned above, before purchasing a car seat, test it out in your car. You can also look for car seats with features that make installation simple, like bubble level indicators and multiple recline angles. Also, when it comes to installing the car seat, you should do it. If you have questions as you are installing your car seat have a child passenger safety technician teach you! After, practice so you are confident not only installing the car seat in your car but in other cars your child may be riding in. You can find a car seat technician at www.seatcheck.org or www.safekids.org. Q: Any last advice for new moms and dads shopping for their first car seat and stroller? A: Do your research and test out strollers and car seats before you buy them! And when it comes to car seats, remember that keeping your baby rear-facing as long as possible – a minimum of two years – is always safest. Thank you so much for all of your helpful advice! I learned a ton of new information about car seats and strollers and hope this information is helpful for other first-time moms in the future. Please note: I have been gifted a Bravo Trio Travel System from Chicco, all opinions, interview questions, and images are my own. Baby Registry Pros and Cons. Nantucket Babymoon.